Julia Cheng and Si Rawlinson succeeded brilliantly in their eloquent interpretation of political and social issues of our time, encompassing a variety of feelings and expressing the sense of urgency in dealing with such complex topics. 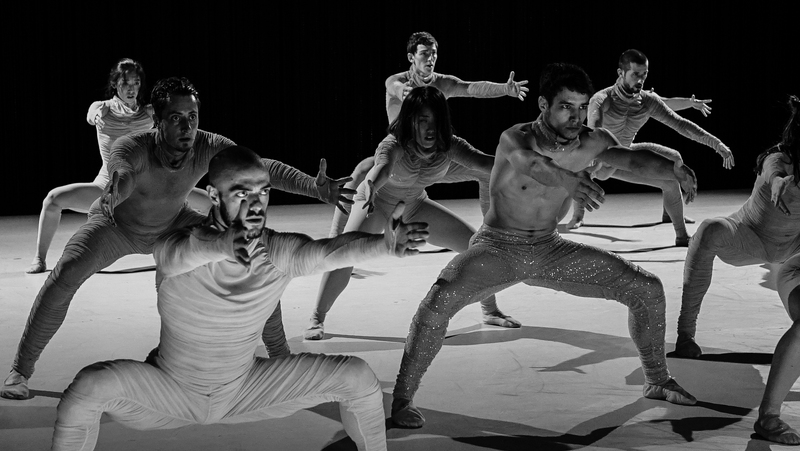 Orlando Warrior is an intimate and fascinating piece of dance that delves into ideas of hybrid identity, gender, and freedom, through a savvy mix of contemporary dance, martial arts and waacking. A barely lit figure wrapped in a light fog stands at the centre of the stage, wearing a black blouse and long skirt – a not so typical warrior’s outfit. Her slow sharp movements are defined by straight legs and arms that draw patterns in the air, mimicking battle gestures. Slow and fluid phrases describe a mesmerising ritual of preparing for the imminent inner war. The action is sustained, with some tension in the movements, accompanied by a steady rhythm that gets faster when the performance is taken to a more dynamic level, brandishing a sword and breaking into swirling and punchy movements. Choreographed and performed by Julia Cheng, the piece is enriched by the stunning collaboration with sound designer and musician Simon McCorry, who plays live cello and other looping devices. Inspired by Virginia Woolf’s novel Orlando, Julia Cheng examines what it means for her to be a woman of mixed heritage. Drawing from the Mulan image of a male fighter behind a female form, she gracefully interprets the urgent need of sharing her feelings and finding a space in the society. 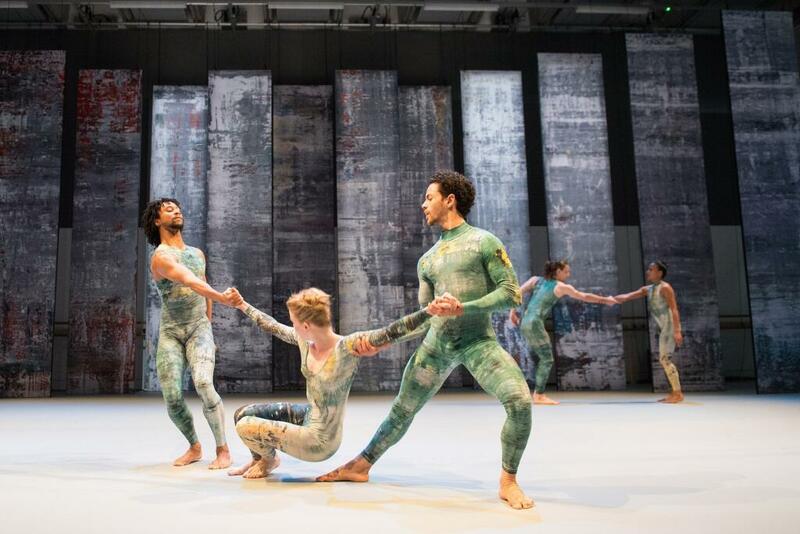 Blending break dance and contemporary movements, Ink follows the struggle of a writer between art and dissidence. Inspired by the imagery of cinematographer Zhang Yimou and contemporary artist and activist Ai Weiwei, Si Rawlinson uses patterns of Chinese calligraphy to highlight a complex concept. Two bare-chested dancers open the scene – waving a sort of long bamboo stick, an apprentice is learning the art of calligraphy. Rigorous and repetitive writing patterns, strictly taught by the master, alternate with delicate dance sequences that reveal the stunning chemistry between the two dancers. Left alone by his master, the writer is immediately approached by two figures with the intention to question his cultural beliefs and values. They push him and raise a tension from which he cannot escape; a sequence of punchy movements and firm gestures trigger a successful brainwash that drags him to their side. An incredibly passionate dance unfolds, made of high jumps, kicks and suspensions, highlighting the versatility across different genres. 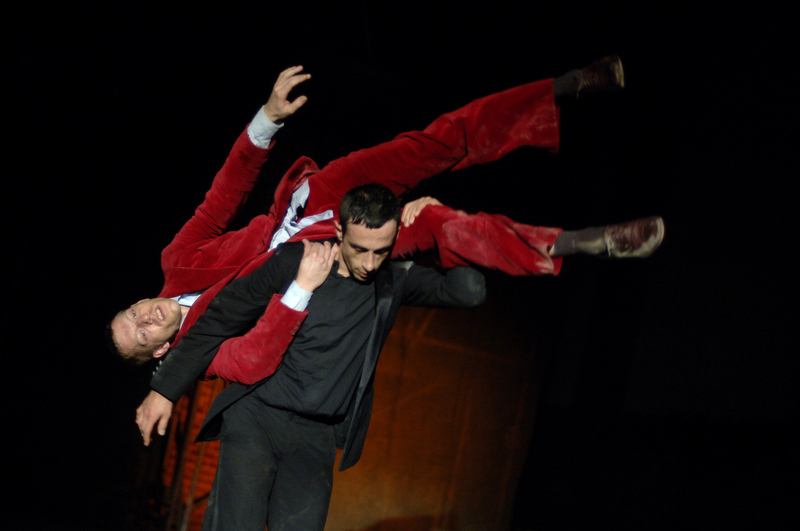 It is an intriguing showcase of astounding dance abilities and muscular virtuosity. When the master reappears the three of them fight him with energetic power, attacking and letting go, pushing and grabbing him in a relentless fight, drawing attention to the brutality behind abusive power and control. Left alone in his last spasm of life, the final scene sees master and apprentice face to face in a poignant dramatic dance. Ink is a brilliant extract of a full length show that will premiere at the Curve Theatre in Leicester on 20th October 2017. Reviewed by Francesca Marotto at the Southbank Centre on 7 October 2017.
d’avant – 4 singing dancers or 4 dancing singers?